My DH, Tom, and I celebrate our anniversaries (yes, plural) this year by taking a hike. 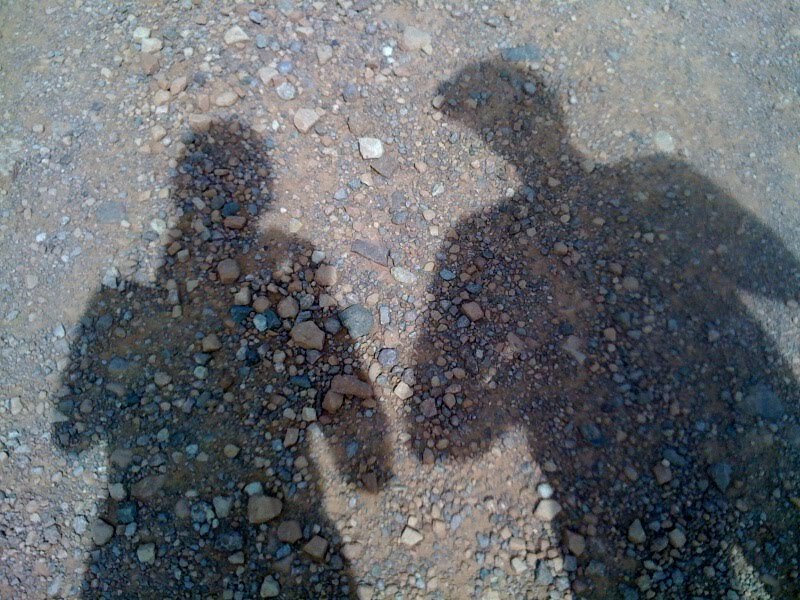 Halfway up the trail, I took this photo of our shadows. It reminded me that no matter how many anniversaries we celebrate (which I hope is a lot), and no matter how old we are or what we look like, our love will remain and we will be companions on the path of life. "Which anniversary are you celebrating?" You might ask because for some reason, that number hints towards where the couple may be in their lives. For example, if it's your 1st anniversary, you may think, "Oh! They are SO in love...still on their honeymoon, really!" If it's their 30th anniversary, you may think, "Wow! You made it through all of that and still like each other?" So here is the scoop on us so you can surmise where we are in our marriage. We just celebrated our 2nd, 5th and 6th anniversaries. Tom and I were legally married in early July 2004 while he was home on leave from his one-year tour in Iraq with the Army National Guard. It was a private ceremony with my three sons (who were 7, 7 and 8 at the time) and a couple of friends. A week later, Tom's leave was over and he flew back to rejoin his unit for the rest of their tour -- which had more than six months remaining. During that time we had a standing date every day via Instant Message at 9:30 p.m. my time (as I was ending my day), which was 6:30 a.m. his time (just before he started work). When his deployment was over in February 2005, we planned our wedding ceremony the following July, but had to set the date almost two weeks later than our official first anniversary date...which means we have two July anniversary celebrations that are two weeks apart. Today marks the 2nd anniversary that we have celebrated this month. This year marks both our 5th wedding (ceremony) celebration AND our 6th marriage celebration...which is how we celebrated our 2nd, 5th and 6th anniversaries this year. The good thing is that if people forget our first July anniversary, they have a two week window in which to still acknowledge it AND not be late. The better news is that we agreed today to renew our contract and stay married yet another year. Yay for the contract renewal! Your wedding (5 years ago) was one full of love and commitment and promise. Here's to the next 2, 5, or 6 (take your pick). You two are a great example to me. Congratulations and Happy Anniversary!! DH likes this post and still agrees to another year.